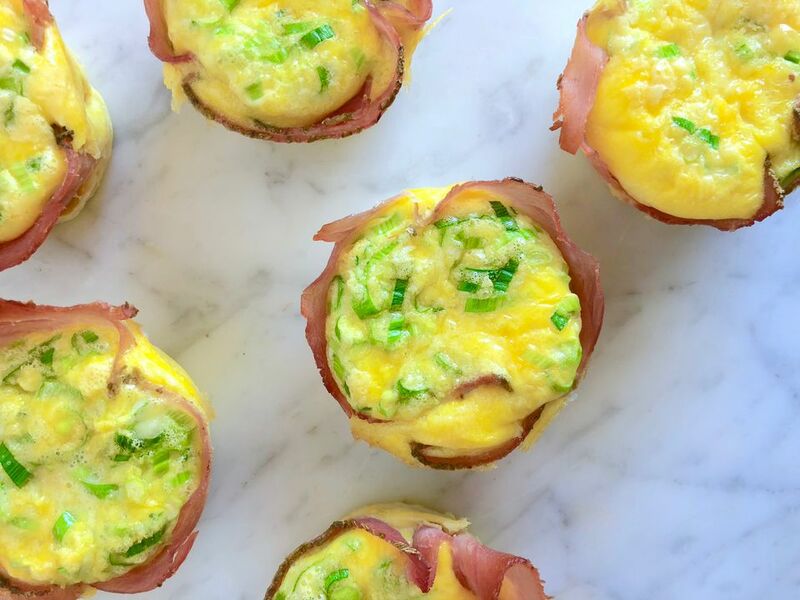 These ham and egg cups are crazy easy and crazy delicious—a winning combination if ever there was one. They are simple enough to make on busy weekday mornings. They are also tasty and pretty enough to make for guests if you're hosting a weekend brunch (double, triple, or quadruple the recipe as needed). Make ahead tip: They are so easy, there's not much of a reason to do this, but you can make them up through step 5 the night before. Cover and chill, bringing them out to room temperature when you preheat the oven to take the chill off before baking them. Extra bonus: they are endlessly flexible—scroll down for variations. Spray a muffin pan (6 tins) with cooking oil or grease with butter. Ideally, use a nonstick muffin pan. Line each tin with a piece of ham. Let the center of each piece of ham drop into the bottom of the tin, then press it down and along the edges, letting the ham fold to fit the tin. Put 1 tablespoon of cheese in the bottom of each ham-lined tin. Set aside. Trim the green onions and finely chop the white and light green parts. Discard the dark green tops or reserve for another use. Divide the chopped green onion evenly between the 6 tins. Crack the eggs into a medium bowl. Whisk the eggs until smooth, with no puddles of yolks or strings of whites. Add the milk and whisk to combine. Divide the egg mixture evenly between the 6 tins. Pour the mixture gently into the tins. As you pour, some of the egg mixture may flow in between the tin and the ham—don't worry, that's why you've sprayed the tin with oil! Bake until the egg mixture puffs slightly and is set, about 20 minutes. Let the ham and egg cups sit a few minutes before removing them from the tins. Use a spoon or small spatula to gently remove the ham and egg cups from the tins. Serve immediately (although they aren't bad just warm or even at room temperature). Mix up the type of cheese: try parmesan, gruyere, goat cheese, truffle pecorino, small cubes of brie—whatever's your favorite. Use prosciutto or speck instead of regular ham, or try honey-roasted, peppered, or otherwise flavored ham. Enrich things by using cream instead of milk. Add 1/4 teaspoon freshly ground black pepper to the egg mixture. Add a teaspoon or so of freshly minced herbs along with the green onions—chervil and dill are particularly good choices. Add a tablespoon of cooked vegetables along with or instead of the cheese—spinach and peas are tasty options.